Freedom Scientific’s SARA™ (Scanning and Reading Appliance) is an affordable and easy-to-use solution for those who are blind or low-vision to read a wide variety of printed material including books, mail, newspapers, magazines, and so much more. SARA uses the latest in advanced optical character recognition (OCR) technology to scan text and then read it aloud in crisp, clear speech in a variety of voices and languages. You can start using SARA right out of the box, with no experience or training. Just place your book or document on the scanning area, and press the scan button. SARA automatically scans and recognizes the text, and reads it to you. During the reading, you can adjust the voice rate and volume, as well as fast forward and rewind, or pause and take time to examine a document in detail. You can even spell out words to get a better understanding of what is being spoken. The low vision user also can attach the SARA to a computer monitor, providing colorful, large print access to complement speech. This feature even allows the low vision user to change the print type style, color, size, and spacing to fit individual needs. SARA now plays the audio elements of DAISY formatted Digital Talking Books, and comes with a starter library of popular classic literature. A DAISY book is a multimedia representation of a print publication for the print-disabled, such as someone who is visually impaired. The SARA also plays audio books in most other formats that are available. 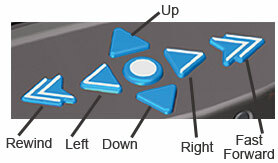 To quickly recall a button's function, just press the Help button, and then press any other key. SARA speaks the button's function. Choose the human-sounding reading voice of your preference. SARA's RealSpeak®	Solo voices are clearer than ever. 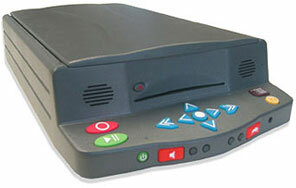 Attach the SARA to a computer monitor for colorful, large print access to complement speech. You can even change the print type style, color, size, and spacing to fit your needs, as well as choosing the color you prefer for the background. Words being read are highlighted, while displaying on a monitor. You can choose the highlighting color to make seeing the words easier. Scan in background allows the user to continue reading one page while scanning the next. SARA supports scanning and reading in multiple languages: U.S. English, British English, Australian English, Belgian, Dutch, Brazilian Portuguese, Danish, Continental French, Canadian French, German, Italian, Norwegian, Polish, Portuguese, Russian, Spanish, and Swedish. SARA reads many file types, including TXT, RTF, DOC, PDF, and HTML. Use the built-in CD drive for playing books saved on disk or to save documents and books of your own to CD. SARA plays audio books in most formats that are available.SARA comes with a starter library of classic literature.Front mounted stereo speakers.Front audio jack for stereo headphones.Rear power jack.Built-in microphone.Size: 20 in. x 3.5 in. x 12 in. (50.8 cm. x 8.89 cm. x 30.48 cm.). Approximate weight: 18 lbs. (8.16 kg.). 100 - 240 volt power.